Carefully designed to fit 6 bottles, the wine bag with removable, padded bottle dividers keeps the bottles free from breakages and chilled during travel. The section for each bottle is large enough for champagnes and even has room to fit a cooler wrap for that extra bit of chilling. The insulated lid helps to maintain the temperature of the wine, eliminating accidents and keeping everything snug during transport. The latest development in wine carry bags, the Waiter’s Friend Wine Trolley comes with handles and adjustable, removable padded shoulder strap for extra convenience and support. 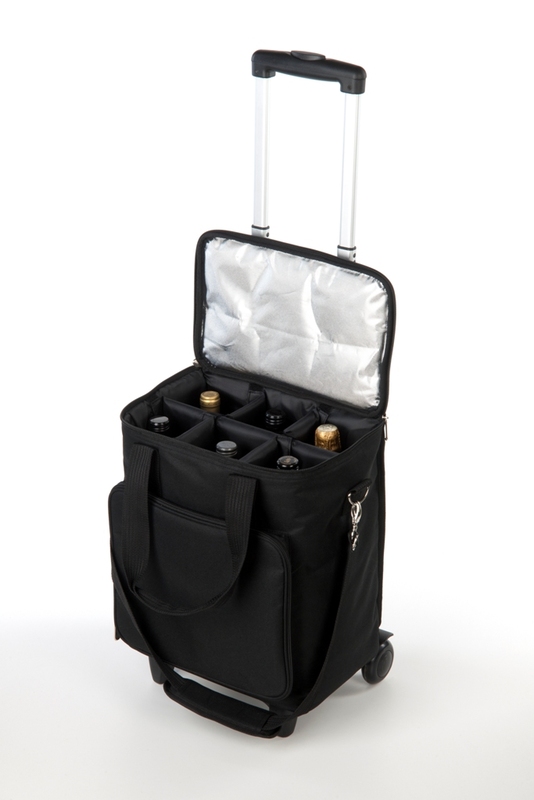 Lightweight with twin easy-glide wheels, whether running for a tube, or chasing down a bus, the bottle cooler bag on wheels aids your efforts, while your wines keep their cool. The wine carry bag features a telescopic aluminium 2-step handle with push button to glide wine bottles across the country. Suitable for all types of weather, the firm waterproof, base protects your wine from the elements. The gusseted front pocket is great for carrying an iPad or tablet, sales literature and today’s paper. It also presents an ideal marketing opportunity – embroidery is available in fine detail on the front pocket from just 5 pcs. Smart branding on the bottle carry bag promotes corporate identity and enhances brand image. Made from durable polyester, in professional Black, the portable bottle carrier is the wine professional’s best friend.